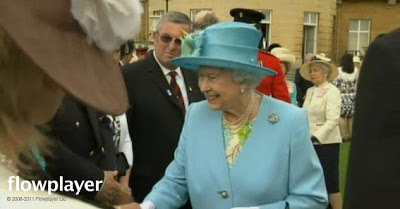 The Queen, Colonel-in-Chief, hosted the Grenadier Guards in the gardens of Buckingham Palace. She inspected The Queen's Company, presented New Colours to Nijmegen Company, and held a Garden Party for the Grenadier Guards Association. Earlier, she received the Governor-General of the Bahamas for an audience. Click for a video from ITN Source. For the audience, it looks like the Pearl Trefoil (maybe? Eh, these printed dresses), but the Grenadier Guards is far more straightforward: regimental badge it is.